HMS Leviathan, a Drake class armoured cruiser was launched in July 1901. She carried thick armour plating, but notwithstanding the weight of armoured decks and bulkheads, she was able to produce 23 knots from her twin shafts. The photograph shows little in the way of superstructure. The upper deck mainly comprising four smokestacks, a rather flimsy bridge, and in a nod to the sailing navy two large masts fore and aft. In terms of firepower, her main armament consisted of two 9.2-inch guns, housed in single gun turrets situated fore and aft. The 9.2-inch guns fired a 380 pound shell with a range of up to 14,000 metres. Her secondary armament consisted of sixteen 6-inch guns, with six on each broadside situated in casements on the hull below the main deck. Four of the guns were on the main deck. In addition she carried twelve quick firing (QF) 12-pounders. She also carried three 3-pounder Hotchkiss guns for use against close targets like MTBs. The ship was also fitted with two 18-inch submerged torpedo tubes. In the best of Edwardian naval tradition - she was bristling with armoured firepower. After completion of sea trials in 1903 Leviathan was despatched to the China Station with its bases at Singapore, Hong Kong and Wei Hai Wei. In 1905, she served with the Mediterranean Fleet and in 1908 after only five years of service she was placed in reserve. She was recommissioned a year later, but then again placed in reserve in 1913. She was recommissioned to serve in WW1 in 1914. After the war, she was once again placed in reserve in 1919, and then finally sold for scrap in 1920. There is little reference to the mutiny that took place in the closing stages of WW1. No doubt at the time it was hushed up. Mutiny was a bad word in the Royal Navy. I found a file at the National Archives in Kew that detailed the investigation, the witness statements and the findings of a court of enquiry. Whilst looking for information on the mutiny on the Leviathan, I noticed a newspaper heading describing another mutiny on the Leviathan that took place a few years earlier in 1909. She was an unlucky ship with two separate mutinies, having been placed in reserve three times, and scrapped only seventeen years after launch. A sound tape held at the Imperial War Museum in London contains an interview with George Terry, who in 1909 was serving as a recruit/trainee on board Leviathan which at that time was being used as a training ship. He recalls the ship's commanding officer being unhappy with the work done during coaling of the ship whilst at Gibraltar. He ordered that it be done again, which created resentment on the lower deck, and during a subsequent parade the ship's permanent seamen (not the trainees), numbering around one hundred men, did not assemble for the parade. Only the Petty Officers, the Leading Seamen and the trainees turned out on the upper deck. The four men who were considered to be the ringleaders, were arrested and put on trial, and received custodial sentences. The next, and more serious mutiny aboard the Leviathan occurred during war time in October 1918. The ship was then under the command of Captain Bertram Sutton Evans. A career officer, who had joined the Navy in 1884, but who had a somewhat checkered record. In 1912 whilst commanding the cruiser HMS Pandora, in the rank of Commander, he was reprimanded, when following a gun-layers test, his ship had been found "in want of supervision of training and organisation for war." However, he was nonetheless promoted to Captain in 1913 and given command of HMS Europa. In October 1913 he was reprimanded again for the unsatisfactory way in which he conducted his executive duties whilst in command of Europa. He was placed on half pay for a period of one year. However, again he was given command of a warship when he was posted to serve as Captain of HMS Implacable in 1917. 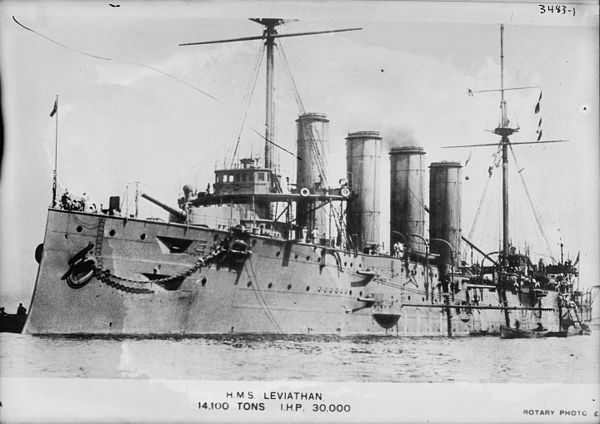 In April 1918, he assumed command of HMS Leviathan. The mutiny occurred on Sunday 6th October 1918, whilst the ship was stationed at Birkenhead. Captain Evans had addressed the ship's company that morning, assembled on the quarterdeck, and notified them that all leave was being cancelled that day, because twenty-nine men were still absent following leave. He said he could not trust the ship's company to return on time. The cancellation of leave and the way Captain Evans addressed the ship's company created a great deal of resentment on the lower deck particularly amongst the engine room stokers. As a result about one hundred ratings went ashore assembled on the jetty and generated a great deal of rowdiness. The Captain then ordered a bugle to be sounded calling for the men to assemble for divisions (parade). A few men obeyed the order by returning back onboard, but most, then proceeded to the dockyard gate, refusing orders given by a Petty Officer, stationed at the gate, to stop and return to the ship. They proceeded into town, and in their eyes were simply taking unauthorised leave, which in their opinion they were due. In fact it was mutiny. However, a large number of the men came back to the ship during the afternoon. They had their tea, changed their clothes, and then went ashore again. This time a party of one corporal and six Royal Marines armed with rifles (but without ammunition) and, as ordered, without bayonets fixed, had taken a position at the dockyard gate. However they were easily swept aside by the mutineers, the Marines being under orders not to use violence for fear of making things worse. The mutineers came back aboard the ship on Sunday night, but instead of returning to their duties, they left the ship again on Monday, since no restriction had been put in place to prevent their leaving. It was almost as if the Captain was "giving them enough rope," rather than bringing the breach in discipline to an immediate halt. I think he unintentionally allowed circumstances to get out of control. Most of the mutineers returned by Tuesday morning at which time a strong force of Marines had been mustered from various warships to reimpose discipline, but the men returned of their own volition. The ship left the dockside and moved into midstream where re-coaling was undertaken on Wednesday. The Senior Naval Officer (SNO) Liverpool mustered and addressed the ship's company and then spoke individually to each of the men involved in the disobediance. He was trying to understand the reasons that led to this, and what were were their grievances. However, few if any of the men listed any grievances or made complaints about the Captain, the officers and senior ratings. Certainly they had been upset by the cancellation of leave, and by the Captain's use of the words "lack of trust" for the ship's company. By Tuesday, the ship's company were working normally. The enquiry found that the actions taken by the dissenters were spontaneous, they were not premeditated and they were not organised. There had been no damage to the ship or other property, other than to a piano that had been carried onto the dockside. The mutineers were coming back and forth from the ship. The enquiry found that the actions taken by the Captain and his officers to arrest the development early, and to get in amongst the men and bring the disobediance to a halt were inadequate. Most of the mutineers were young, Hostilities Only (H.O.) ratings, and were not aware of the gravity of their actions. It was found that in general the discipline on the ship was lose. There was over-crowding on the ship and a lack of sleeping space with some of the crew sleeping on the upper deck or in the gun turrets. When in harbour much time was taken up in coaling. This was long, tedious and dirty job. A fine layer of coal dust covered everything. It got in the eyes and in the throat. When not in harbour the ship was on war partrols and convoy duties. I suspect it may not have been an efficient ship, and in the Navy they always say an efficient ship is a happy ship. (1) The general tone of discipline throughout the ship was slipshod and slack. (2) The Captain had made use of a most tactless expression when he said he could not trust his ship's company. 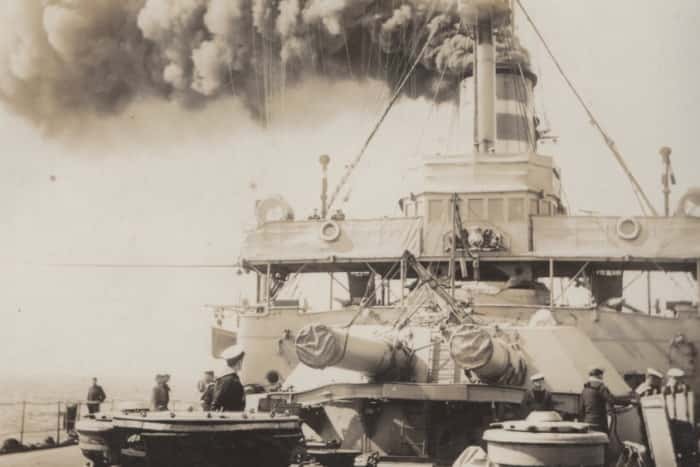 (3) That Commander Sherrin, the Executive Officer, showed lamentable lack of executive initiative, and by his failure restrain the men in the earlier stages caused the trouble to assume larger proportions than it should have done. (4) That the Master-at-Arms had failed to support the executive authority, or to take his rightful place as the Senior Chief Petty Officer on the ship. (5) That the Chief Petty Officers and Petty Officers failed to use their influence for the good of H.M. Service and allowed a lot of youngsters and raw hands to take charge of the situation. The ship had been ordered to re-coal at daylight and proceed to sea at 2200 hours on Monday 7th October. It was felt that the Captain should have mentioned this as the reason for there being no leave allowed on the Sunday, albeit he had every right to admonish the crew for their lack of discipline with regard to returning on time from leave. This was especially important because they were in a state of war. Discipline would normally be ensured by the Executive Officer and the senior ratings, in particular the Master-at-Arms. Captain Bertram ("Bertie") Evans was forty-six years old at the time. He had been a very accomplished cricketer and had played for Hampshire in 1900 and again in 1909. He was married to Eliza Janet Muir and they had a daughter, Patricia Jeannette. Although his handling of the mutiny was considered tactless, he was given another command, and in 1919 he was posted to command HMS Europa, for the second time. The ship was lying in Moudros, Greece. It seems that this order was cancelled, but after he had already left, overland, to join his ship. He died in March 1919, in a Paris hospital following a bout of influenza, presumably the Spanish flu that killed so many that year. Was he a victim of circumstances ? I think he may have been. Did he have the right backing from his officers and men? I think probably not. Was he a poor leader, was he tactless, did he run a disciplined, happy and efficient ship ? I think probably not, but not necessarily from neglect, perhaps more from unsuitability. On Saturday 31st Jan. 2015 I joined members of the Orders Medals & Research Society (OMRS) for a walk along the border with Hong Kong and the rest of China. This area was until recently part of a restricted zone and not possible to get access. This was once known as the "bamboo curtain" a sensitive border in colonial times and one that was patrolled by both the British Army and the Royal Hong Kong Police. In the 1960s through to the 1980s - the British Garrison was quite small and I suppose it's fair to say that had the Peoples Liberation Army (PLA) decided to do so they could have crossed the border at any time perhaps with impunity. However after the joint declaration in 1984 it was only a matter of time before sovereignty would return to China in an orderly and agreed fashion. In the 1980s and 1990s the focus was more about preventing illegal immigrants from crossing the border rather than the PLA. There was no need for the PLA to retake Hong Kong as Hong Kong was very useful to China as a link to the west and a gateway, albeit something of an anachronism that dated back to First Opium War and the Treaty of Nanking signed in 1842. Only once had the border been crossed by an invading army and that was early in the morning of 8th December 1941 (HK time) when the 38th Division of the Imperial Japanese Army crossed the border into Hong Kong and Japan simultaneously attacked Hong Kong, Malaya, Philippines and the US Pacific Fleet at Pearl Harbour. I took the MTR and East Rail out from Central to Fanling and from there by green New Territories taxi to Lok Ma Chau Police Station. We were fortunate to have in this group a number of retired expatriate policemen who had during the course of their careers served out on the border and were able to recount their interesting experiences of policing in colonial Hong Kong and then later serving in the Hong Kong Police post handover. The police station stands on a hill crest approached by a steep drive. When I first came to Hong Kong in 1985 people would come out to Lok Ma Chau to stand on this hill and look across into China. It was a photo stop where you get your picture of China. In those days when you looked across the Sham Chun River there was just ponds and paddy fields but nonetheless it was a tourist attraction and there were the inevitable stalls offering cheap souvenirs. Today nobody really comes to take pictures of China because the border has become much more porous with people coming in both directions either on business or for tourism. It's still a border and you need a visa to go across to shop in Shenzhen. What has really changed is the view. Instead of paddy fields its a modern metropolis that looks like Hong Kong's Central district. With high rise buildings stretching from west to east on the other side of the Sham Chun River also known as the Shenzhen River which marks the border. China in that short space of time has opened up and become the world's second largest economy and Hong Kong now a part of China with a PLA military garrison occupying the premises once used by the British forces in colonial times. It was one of those grey days where you can't be sure whether the haze is mist or pollution but in reality it's probably a bit of both and more of the latter. The picture below shows the modern skyline of Shenzhen somewhat obscured by the haze. In the immediate foreground are the ponds and wetlands that typify the delta area of the Sham Chun River and include the Maipo wetlands now famous for the variety of birds that can be seen there. The Sham Chun River flows to the west into Deep Bay or Hau Hoi Wan. Lok Ma Chau Police Station is still in use as a police station. The building was first built in 1915 originally with two stories, the upper observation deck having been added later. A murder occurred here in July 1930 when the Station Sgt. 's twenty five year old wife Dora Madgwick was killed by an Indian Constable in her living accommodation on the 2nd Floor. The Constable who had run amok, later shot himself. Sgt. Cornelius Madgwick later re-married to Marjorie Knight and he and his wife were here when war started in December 1941. They were both incarcerated in Stanley Civilian Internment Camp where they were billeted in Bungalow 'A' now the heritage museum within the grounds of St Stephens College. The area of wetlands to the front and surrounding fields have little changed over the generations. We then walked along the road which was once restricted to police and military vehicles from Lok Ma Chau to Lo Wo. On the way we passed one of the so-called MacIntosh Forts at Ma Tso Lung. These were named after Duncan MacIntosh, Commissioner of Police after the war who arranged for the construction of several of these hill top forts built along the border. The 1994 map extract below shows this stretch of the border. Notice the train and road crossing at Lok Ma Chau which was opened in 2003 and now a major crossing point into China. Lo Wu was always the main crossing point in earlier years and still continues to be the principal crossing point into China. The map extract below is from a January 1946 map. One immediately notices the the hills were given English names of hills back in Britain like the North Downs, the South Downs, the Cheviot Hills and the Mendips. You can see a track leading out the wetlands and the Police Station standing above the village (not shown) of Lok Ma Chau. There is no bridge. The main crossing point back then was at Lo Wu where the road and railway crossed the border. The railway being part of the Kowloon-Canton Railway then running from Canton to the Star Ferry Terminal in Kowloon. It was here the bulk of the Japanese Army crossed into Hong Kong and followed the road and railway south to Fanling. From Lo Wu we walked along the side of the Indus River now called Ng Tung River leading to Sheung Shui and Fanling after an interesting walk along the old "bamboo curtain" and reflecting on times gone by. These stanzas are taken from a much longer poem by Lord George Byron entitled Childe Harold's Pilgrimage. This a book length poem - so not for the faint hearted. I have shortened the several stanzas concerning the Eve of Waterloo to just two, because it is these two which are most captivating, at least for me. The first stanza vividly conjures up that ball hosted on 15 June 1815 in Brussels by the charming socialite, the Duchess of Richmond. 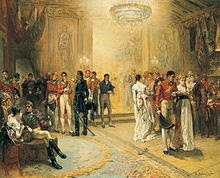 All the officers of any importance including the Duke of Wellington had been invited. It must have been a glittering occasion - the ballroom lit by a mass of candles - the officers in their dress uniform and the ladies in all their finery. Arm! arm! it is — it is — the cannon's opening roar! In the 1970 classic film "Waterloo" in which Christopher Plummer plays the Iron Duke it depicts the Duchess of Richmond's ball brilliantly with the military bands, the Scottish dancing, and the ceremony of the occasion . Here are some stills from that film. Some poetic license has been employed as in actual fact the ball was hosted on the eve of the Battle of Quatre Bras fought on 16 June 1815 two days before the Battle of Waterloo. It was whilst the Duke of Wellington was attending the ball that a messenger arrived from Marshal Blucher with news that Napoleon's army had crossed the border and were advancing towards Brussels. Officers hurriedly left and the next day the army was leaving Brussels heading south to bolster British and Prussian positions at and around Quatre Bras which were facing the advancing French army. Then we are interrupted by the sound of the gun, the foe is approaching and the officers must make their leave to do battle on the morrow. Poetic license again as the cannonading had not yet commenced nor would it until the following day when the Prussian Army under Blucher which were on the left flank, were attacked and after a short and brutal battle suffered a defeat and had to withdraw and regroup. The British led Anglo-Dutch army at Quatre Bras (literally 'four roads' or 'Cross Roads') on the right flank were attacked by Marshal Ney who had some 42,000 men outnumbering the British who initially were defending the cross roads with only 6,000 men. Marshal Ney did not press home the attack fast enough and British reinforcements from the direction of Brussels allowed Wellington to hold the position. The following day Wellington withdrew his army to Waterloo where he intended to make a stand and …………….the rest as they say is history ! I am minded of the flight of Icarus when reading that amazingly inspirational poem "High Flight" by John Gillespie Magee, which so well describes the exhilaration and the wonder of high flying. John Magee was an American who joined the Royal Canadian Air Force. He wanted to support Britain in its hour of need during World War 2 at a time when the Americans had not yet entered the war. He was based in Britain in 1941 flying Spitfires. The poem is very impacting with its powerful images. It's opening line "Oh ! I have slipped the surly bonds of earth" conjures up images of the free spirit, unshackled, soaring the skies and playing among the clouds and ends with that powerful line "put out my hand and touched the face of God". John Magee was born in Shanghai in 1922 to an American father and a British mother who worked as Anglican missionaries in China. He was educated at Rugby School in England and then finished his schooling in the United States where he won a scholarship to Yale. However Britain and Canada were at war with Germany in September 1939 and Magee instead of going up to Yale chose instead to enlist in the Royal Canadian Air Force whilst still only eighteen years old in October 1939. In 1941 he was posted to England joining a spitfire squadron. 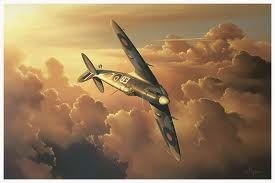 In September 1941 he flew at a very high altitude of 30,000 feet on a test flight for a new model of the Spitfire. He must have found it exhilarating and this gave him the inspiration for his famous poem. Shortly after this he wrote to his parents and scribbled down the poem on the back of the letter. He wrote "I am enclosing a verse I wrote the other day. It started at 30,000 feet, and was finished soon after I landed". Three months later in December 1941, just a few days after the United States had entered the war, John Magee was killed in a collision whilst flying his Spitfire over Tangmere Air Field in Sussex. At the enquiry which followed a local farmer reported that he saw the Spitfire pilot struggling to get out of his aircraft but he was too close to the ground for his parachute to open. He died aged nineteen as did the pilot of the other aircraft Ernest Griffin. The original hand written poem is now held by the Library of Congress. The poem was quoted by President Reagan in 1986 during a presidential address following the explosion and disintegration of the Challenger space shuttle. Russell Crowe well recited the poem in the 1994 film "For the Moment". As a poem it is both inspiring and uplifting. It is also sad that the pilot and poet met his death in the skies that he loved so dearly not long after writing this poem. He was one of many young men who gave their lives in the service of their country at a time of war. In addition to John Magee there was also the loss of the pilot of the Oxford Trainer, Ernest Griffin, with whom he collided. Two brave men who took to the skies - lest we forget. Perhaps for want of trying on my part, I never liked W.H Auden's poetry very much with one or two exceptions and one of which is his poem Musée des Beaux Arts. In this he contemplates the works of the Old Masters and the messages they were imparting and, focusing in particular on Brueghel's rendition of Ovid's story of Icarus - the boy who tried to fly, but flew to close to the sun, the wax melting his wings and he fell into the sea. I like Auden's simple laconic description - "where the dogs go on with their doggy life". It really says it all without really saying anything. It would not work so well with horses, cats or pigs. The cats go on with their catty life ! 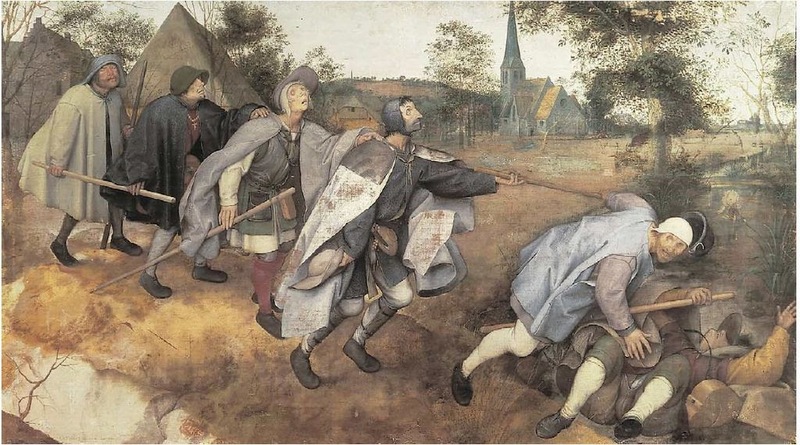 I particularly like the commanding assonance which demands our attention in the opening line of the second stanza - "In Breughel's Icarus for instance". 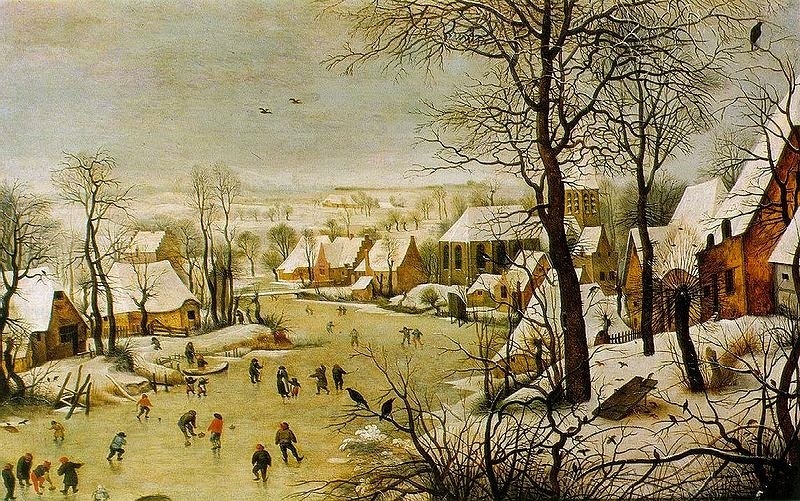 Breughel was a dutch painter - one of the "Old Masters" who was born in 1525 and died aged 44 in 1569. He was painting at the time of the Renaissance. His paintings are quite striking. 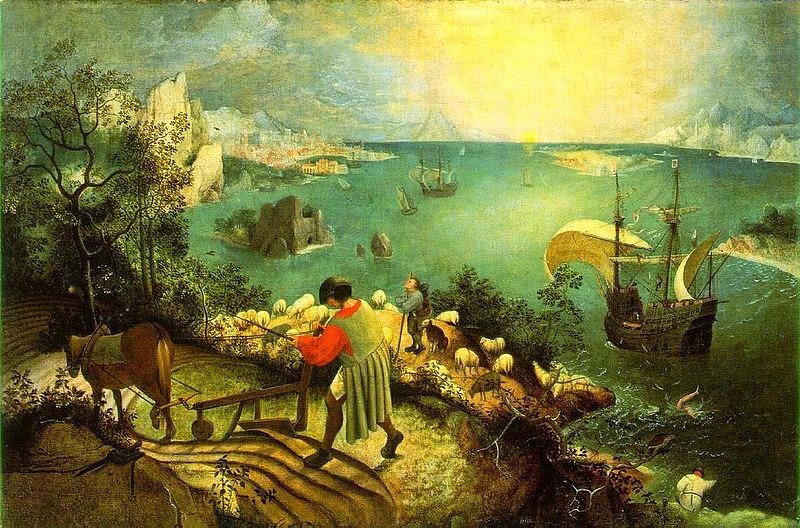 WH Auden's poem leads us to re-look at the Ovidian myth of Daedalus and Icarus. The story is told by the Roman poet Publius Ovidius Naso (43 BC - AD 18), better known to posterity as Ovid. The story is found in Metamorphoseon libri or translated from the Latin "Books of Transformations" better known to us as The Metamorphoses. This magnum opus contains fifteen books and 250 myths. 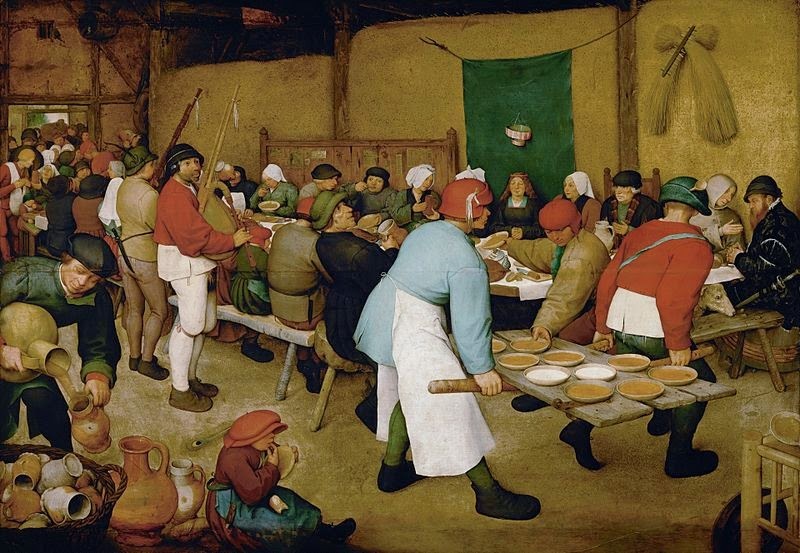 Many of these myths figure in the works of the Old Masters. The story of Icarus and Daedalus is found in Book viii. Daedalus a wily architect had been exiled to Crete and placed in the service of King Minos who ordered him to build a labyrinth to contain the Minotaur, half beast and half man. Theseus, King of Athens, arrived in Crete to slay the minotaur. King Minos's daughter Ariadne fell in love with Theseus and persuaded Daedalus to reveal the secret of the labyrinth which allowed Theseus to slay the beast and make good his escape from the labyrinth. When King Minos heard this he imprisoned Daedalus and his son Icarus in the labyrinth. This was a last farewell - then he took off. So Daedalus flapped wings to guide his son. And taking them for gods, stood still in wonder. Was there to tempt him as he steered toward heaven. His father’s name, were gulfed in the dark sea. The boy’s torn wings washed on the climbing waves. And where it lies the land’s called Icarus". Daedalus warned Icarus not to go to close to the sun but Icarus did and the sun melted the wax which bound his wings and he dropped into the green sea and that was that. 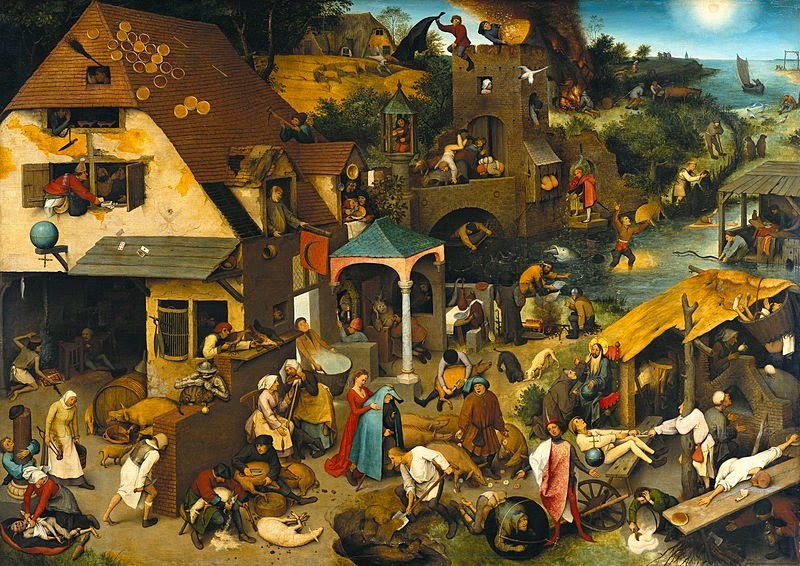 The landscape is classic or Arcadian so often depicted in the works of the "Old Masters". The sun is indeed shining brightly, the plough-man is busy ploughing his plot, the shepherd tending his flock and the fisherman is casting his line. The sails on the expensive delicate ship are billowing - everybody is busy doing what they are doing and life goes on but not for Icarus whose white legs are seen disappearing into the green sea. On a pond at the edge of the wood"
In the Ovidian myth the plough-man, the shepherd and the fisherman are indeed present and they bear shocked witness to the flight and the plight of Icarus, unlike in the painting, where they are too busy except perhaps for the shepherd who is simply looking away. WH Auden published his poem in 1938 at a time when war clouds were gathering over Europe. We can picture him standing in front of the painting in contemplation of our indifference to suffering and how so often we turn away like the shepherd.